The restoration started in 2012 with scaffolding first going up in Pan House 3 and around the remains of Pan House 4. Work continued through the summer with seven buildings in total within the historic core being propped: both Pan Houses 3 and 4, Stove Houses 2, 3 and 4, the Link Block and the Packing Area. In order to secure the structural condition the walls of the building were entirely rebuilt. This involved brick by brick dismantling of the walls and excavation down to foundation level before rebuilding. In places these had partly collapsed as they had been built on metal plates and girders that had disintegrated due to the corrosive effects of salt reacting with the metal. By May 2013 the rebuilt Stove House 5 was taking shape (Stove House 5 was dismantled in 2009, in order that it could be entirely rebuilt as the new visitor and conference centre adopting the original location and plan but with a new concrete base). The framework for the new structure was largely new but reuses the previous brickwork and wood frame and paneling throughout. The blog by archaeologist Chris Hewitson onsite during the restoration explains the progress and challenges whilst also adding fascinating glimpses of the site history. 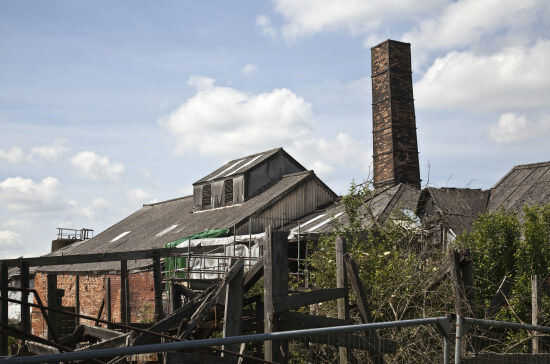 View our online gallery that shows images of the restoration process, alongside images from the history of the Salt Works. 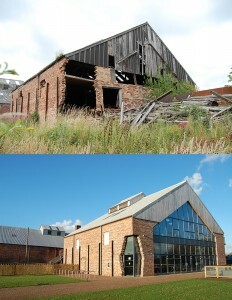 See the side by side transformation gallery with before and after images from Donald Insall Associates Ltd.
There’s still plenty of work going on at the Salt Works. Find out about our ongoing restoration projects.